I was fortunate enough to visit the world's capital of fashion and design for 48 hours to visit Salone del Mobile - Milan design week. Along with a group of friends, we booked our plane tickets months in advance to get cheaper flights. For accomodation, we managed to find a 6-bed Airbnb for a great price, spending only £140 for the weekend. The key to getting cheaper hotels and Airbnb’s is to look out of the centre of the city you are going to. For the majority of European cities, public transport is cheap and accessible, which makes getting to a place away from the centre a lot more feasible. We arrived on Friday morning around 10 am and caught a bus to our Airbnb. Milan has a very modern and easy public transport system and you can buy a 24-hour ticket for €4.50, for use on buses, trams and subways. After getting settled in and everyone arriving, we headed into the centre of Milan to find some of the design exhibitions - Qeeboo's pink rabbits and gorillas in particular. After roaming around Milan going in and out of shows and piazzas, we stumbled across the exhibitions in the University of Milan's quad, where we found an interactive IKEA show. During design week, showrooms open their doors to showcase up and coming products, offering free appetizers and alcohol which is always a win! After getting very merry on the free alcohol, we headed to the Aperol bar which overlooks the beautiful cathedral. On Saturday we headed for the Design show. With over 1,100 exhibitors across 20 pavilions, the show is truly massive and hosts brands like Smeg, Bentley, Samsung & Versace, each with amazing exhibition stands. It is such an epic show that you really need to witness in person to understand the sheer scale of it. Unfortunately, there's no free alcohol but nevertheless, it is still a great day and well worth a visit. Our last evening was spent at a Maio Restaurant - an incredible place that sits facing the Milan cathedral. I don't think there is a better location within Milan to enjoy a meal and surprisingly the food wasn't too expensive. With half a day left before we had to catch our flight back home, we headed into the centre on the subway to explore some more. A few of the group decided to go to a local museum whilst I wandered around the streets to get some photos. 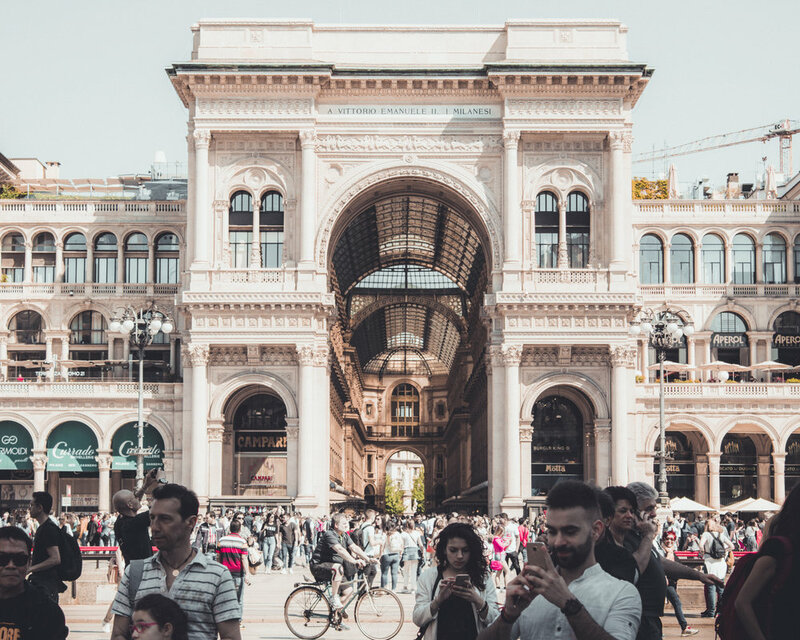 I’d definitely recommend going window shopping in the Galleria Vittorio Emanuele II, Italy's oldest active shopping mall and a major landmark of Milan. This high-end shopping arcade is home to brands such as Louis Vuitton, Prada & Gucci, who sit alongside incredible architecture - two glass-vaulted arcades supported with beautiful cast iron rafters. Milan was an amazing trip and I loved every second. The food and wine is relatively cheap and getting around is no problem, meaning you can explore more of the city during your stay. All in, I only spent £240 and made memories that will last a lifetime. I’d highly recommend you go and experience this city first hand, you won’t be disappointed!